Reap. Of the various traditional markets in the Siem Reap area, the Old Market is the most popular with tourists and visitors, offering the greatest selection of souvenirs and curios of any of the traditional markets. And the area around the Old Market is burgeoning with shops, galleries, restaurants, bars, massage and more. 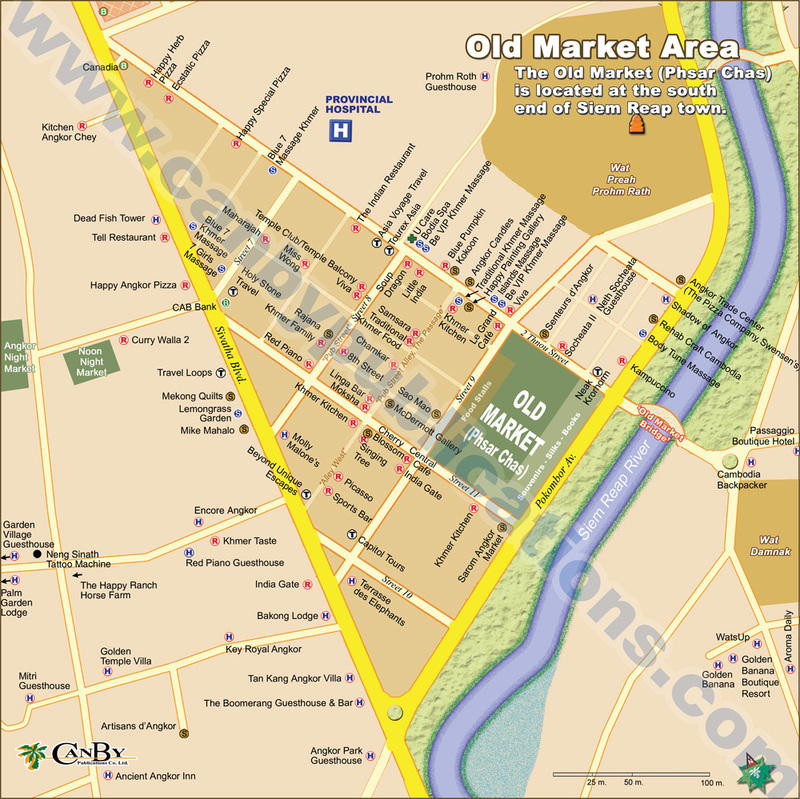 The Old Market is located on the river at the south end of the Old French Quarter. During the day and into the early evening the south side of the market near the river is alive with souvenir and silk vendors hawking a wide variety of Cambodian handicrafts, textiles, statues and curios. The Old Market is also a good place to pick up post cards, tee-shirts and other small items if you haven't already bought them from the vendors at the temples. The north half of the market caters primarily to the locals, vending fruit, vegetables, meats, clothes, appliances and such. A number of inexpensive food stalls line the northern edge, serving local fare in interesting though sometimes hygienically challenged conditions. The Old Market closes at sunset, but many of the souvenir vendors in south section of the market stay open past 8PM. While the Old Market offers the greatest variety of souvenirs, the streets in the area around the market harbor several little galleries and boutiques, each with its own particular style, collection, art or specialty. The boutiques and galleries often offer higher quality, more select items, as well as more comfortable, often air-conditioned shopping venues. See page 55 for more information on boutiques and galleries. Other conveniences in the Old Market area include dozens of restaurants and pubs, especially along Pub Street, several travel agents and Internet shops, a couple of bookstores and several roving booksellers, convenience stores, banks and ATMs, and several reflexology/massage shops. After the sun goes down, the focus shifts a block east of the Old Market to 'Pub Street,' so named for the numerous and varied restaurants and pubs that line the road. It all began in 1998 when Angkor What? Bar opened its doors - the lone pub on a quiet street. These days Pub Street in packed end to end with bars, restaurants and shops. You can find all kinds of cuisines on Pub Street including Khmer, Thai, French, Vietnamese, Indian, Italian and a variety of other international foods. Most of the bars are open all day but really get going around 5:00PM as people return from the temples and come to take advantage of the various happy hour deals. In the later evening the street is blocked to motor traffic, allowing pedestrians to stroll easily. It's then Pub Street really comes alive as the curbside seating at the restaurants fills up and the bars crank up the music. The whole 'Pub Street' area is the center of nightlife in Siem Reap these days with most places staying open until at least midnight and couple place running until near dawn. Running parallel to Pub Street about a half of a block over is 'Pub Street Alley,' a.k.a. 'The Passage,' offering a somewhat more relaxed, artsy atmosphere - a narrow pedestrians-only lane lined with little galleries, shops, bars, cafés, Khmer restaurants and boutique guesthouses. The alley provides a quaint, shaded, tranquil retreat from the Pub Street crowds. And in a recent development galleries and bars are popping up along the other alleys around the Pub Street area..